AMF-02 is an Automatic mains failure module is designed to protect and control Diesel generator. It uses advanced single chip Micro-Controller for an easy and trouble free D.G. set control. It uses Jumbo 16 x 2 LCD display for Read out and memebran keypad for interaction with user for various parameter settings. It has Data logging facility to check every event. This Unit works in AUTO/MANUAL mode. If mains supply is available unit keeps the Load on Mains. In case of Mains failure or under voltage, Amf Controller will be activated by internal 3 phase monitoring ,if Mains fail for entire START DELAY period the CRANK cycle will be activated . The CRANK and REST period (interval bet'n crank) and crank attempt are settable by user. When Engine takes speed the internal GVM detects the voltage and also check LLOP to make "NC" to "No" to disconnect cranking. After the engine Warm-Up period is ellapsed, load is switched over on D.G. When Mains supply RESTORE and persist for entire Restore delay time the D.G. supply is disconnected after set Time delay ( settable Interchange time delay ) mains. The engine runs idle without load in cooling time delay before shutdown. In the manual mode Engine START / STOP , Mains /Gen Contactor ON & OFF can be done manually by push buttons. In periodic Test mode D.G. can start for setted duration on particular TIME and weekday. All the parameters like Day,Time and Duration are settable by user. The Generator is protected against any Generator related fault i.e. LLOP,HWT etc. in AUTO / MANUAL and PERIODIC TEST mode . or any electrical fault like Over Load, Mains or D.G. check back or Low / High Mains or D.G. Voltage. â€¢ Most advanced Microcontroller design. â€¢ Universal supply voltage 6 to 33 VDC. â€¢ 16 x 2 Jumbo LCD Display â€¢ Detachable connector to easy onsite installation. â€¢ 100 events internal storage memory â€¢ Date ,Time parameters . â€¢ Auto, Manual, Periodic test mode. â€¢ Run hour meter. â€¢ Built in 3 Ph. 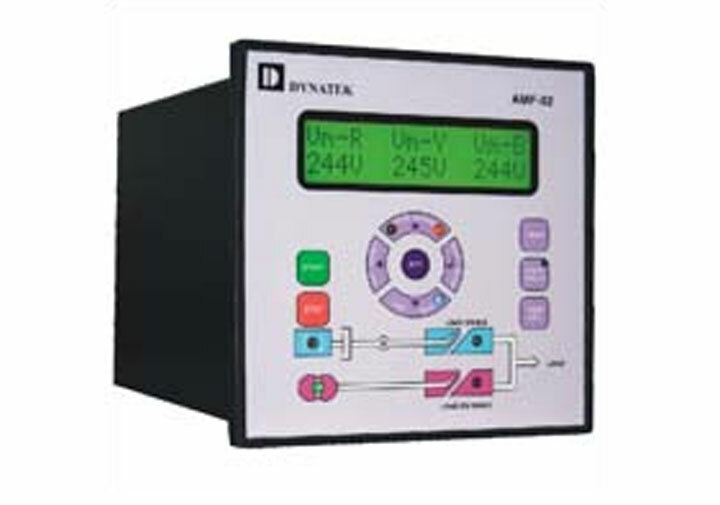 Vltage monitor for Mains & D.G. â€¢ View 100 events log facility. â€¢ Built in 3 Ph. Over load Protection. â€¢ Membrans keypad with various colour LEDS. â€¢ Built in 3 Ph. Load current monitor. â€¢ 40 on site programmable parameter. â€¢ Mains High / Low voltage Alarm. â€¢ 8 Isolated open collector outputs. â€¢ D.G. High / Low Voltage Alarm. â€¢ Dual or Single Battery selection for Cranking. â€¢ Batttey Voltage monitor â€¢ Multi crank attempt with Crank and Rest Settable time periode. â€¢ Battery LOW Voltage Alarm. â€¢ Automatic crank disconnection to protect Engine over Cranking. Over Voltage withstand : 36 VDC max. Operating Current : 500 mA Max. Digital inputs : Optically isolated type suitable for + ve and ve Signal. Open Collector O/P : 500 mA Optically isolated. â€¢ Crank attempts â€¢ Attemps interval. â€¢ D.G. High/Low voltage â€¢ Mains high/Low freq. Dahisar (E), Mumbai - 400068, Maharashtra, India.